I joined Nexus in April 2004 (aka the “Stone Age”). I am a program director responsible for the Boards and Commissions Leadership Institute (BCLI) which trains and places participants on publicly appointed boards or commissions, with the goal to advance equity in the Twin Cities region. 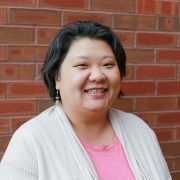 I am an active community volunteer, serving on the boards of the Asian Economic Development Association, East Side Neighborhood Development Company, the F.R. Bigelow Foundation, MN Housing, the St. Paul Planning Commission, and Voices for Racial Justice. I obtained my bachelor of arts and master of arts degrees from the University of Minnesota. When I do have free time, I can be found running around town with my family or with my nose stuck in a book. That one day I will have contributed a tiny part to creating a better world for our children.